This good looking Japan filly is appropriately named DERBY DOLL as she was born on Kentucky Derby Day in 2017. She is from the first crop sire named Japan. 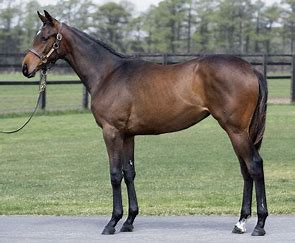 Japan is by international super star sire MEDAGLIA D’ORO and comes from the family of VERAZANO (multiple G-1 winner and Champion Older Male). Japan was a fantastically consistent top flight runner; a multiple stakes winner and Graded Stakes Placed while finishing just once off the board in his racing career. Derby Doll is extremely well bred with a 5x5x5 cross with Mr. Prospector, a 4x5x5 cross with Northern Dancer, a 4x5 cross with Lyphard and a 3x4 cross with Capote. This striking filly is very leggy and should grow to be a decent sized athlete. As a NY bred, she is eligible for the lucrative NY bred restricted races. The trainer is yet to be determined.